Our BIGGEST sale of the year is on now through Monday, September 17, 2018! Stock up on all your favorite NWC Naturals® products! In between the BBQ and the last trip to the beach, don’t miss these deals as we say goodbye to summer. 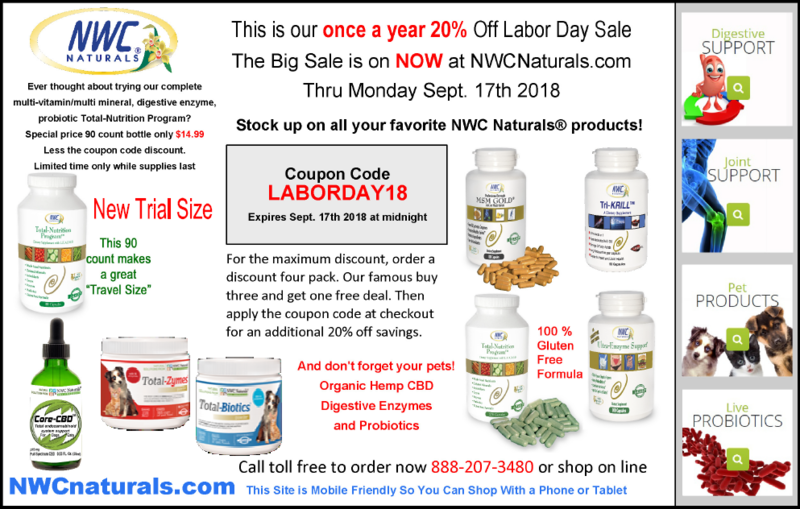 Save on all your favorite NWC products including: MSM Gold®, Ultra-Enzyme Support®, Pro-Biotics Plus®, Belly-Ease™, and more! Be sure to enter code LABORDAY18 at checkout to get 20% off everything on our site! Offer expires Monday, September 17, 2018. Shop online or call (888) 207-3480. Have you always wanted to try our most popular multi-vitamin multi-mineral formula? Our new Total-Nutrition Program™ 90 count bottles are the perfect way to try this great formula. It also makes a convenient travel size bottle to pack in a suitcase or throw in a carry-on this summer. If you already know and love our Total-Nutrition Program™ use this low price opportunity to stock up now (while supplies last)!